All linen, towels etc supplied and changed weekly. Cancellation with more than 21 days prior = no charge. Cancellation with 7-21 days prior = 50% charge. Cancellation at less than 7 days prior = 100% charge. Payment due in full 28 days prior to stay. Prices during holiday periods may be higher. 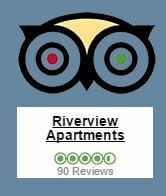 Apartments are fully serviced weekly or without servicing at a reduced rate. Keys can be posted at no charge with 24 hour notice.